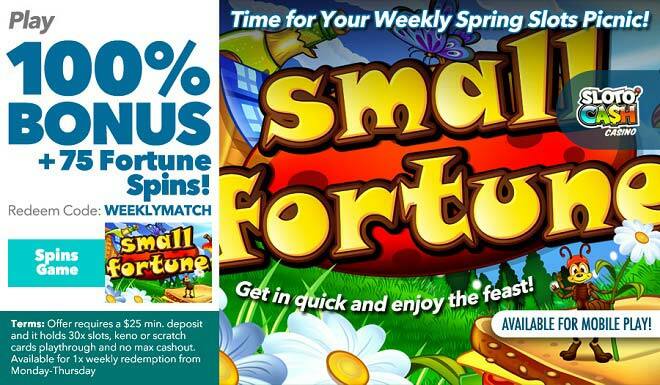 A Weekly Picnic of Spring Wins: 100% Match + 75 Free Spins! They say nothing unites a brand new season and the senses like a picnic! Expect when you combine it with wins, then you really got something going! This April, join Mr. Sloto as helps you fill your basket (or account!) with a 100% Match + 75 Fortune Spins! Enter Spring by spinning Small Fortune where two Wild ants and the Scatter Girl will help you gather wins. Land free spins when one Wild appears on both reels 1 and 5 with at least one picnic basket on reels 2, 3 or 4. During the free spins round all prizes are multiplied by the Wild symbols that appear in the triggering combination. Create the perfect Spring ambience come rain or shine this April when you deposit as little as $25 to play with a 100% Bonus + 75 Fortune Spins!